Dr. McMonagle is an Associate Professor of Radiology, Musculoskeletal Radiology Fellow, and Dr. Vinson is an Assistant Professor of Radiology, Musculoskeletal Radiology Division, Department of Radiology, Duke University Medical Center, Durham, NC. Linking the axial trunk and upper extremity, the shoulder joint plays an imperative role in most daily activities, allowing us to position our hands in space. Further, the joint acts as a small fulcrum for a long lever arm, predisposing the rotator cuff to injury, especially from the rapid accelerations and decelerations inherent to most sports and even some activities of daily living. Shoulder anatomy and biomechanics, particularly those of the rotator cuff (RC), endow the glenohumeral joint with dynamic and static stability throughout a substantial range of motion. The interconnected supraspinatus, infraspinatus, teres minor, and subscapularis musculotendinous complexes constitute the rotator cuff and act as the shoulder’s primary functional unit. Because of the rotator cuff’s crucial role, RC pathology may lead to considerable limitations in daily routine, work, and leisure/sporting activities. Shoulder magnetic resonance imaging (MRI) improves the sensitivity and specificity of diagnosing RC disorders, reduces unnecessary arthroscopic procedures, and provides important clinical information to guide patient management. This review will cover recent literature regarding RC anatomy and the clinical presentation, evaluation, and management of RC disease. We will discuss new observations about the strengths, inherent blind spots, and diagnostic effectiveness of shoulder MRI, and then outline the classification of rotator cuff MRI findings and their impact on patient management. Finally, we will present an effective search pattern approach to evaluate the rotator cuff on shoulder MRI examinations. Knowledge of the RC tendinous insertions onto the proximal humerus, an area known as the rotator cuff footprint, makes it easier to determine the extent and location of abnormality. Much has been written recently about the anatomy of distal RC tendons as they interdigitate to insert upon the 3 facets of the greater tuberosity (superior, middle, and inferior), although their location and insertion appear somewhat more arbitrary by MR imaging. Standard landmarks and techniques used in MRI to demarcate the tendons will be elaborated upon later. Although the true pathogenesis of rotator cuff tears remains unclear, mechanisms of RC degeneration are broadly divided into extrinsic and intrinsic factors. In reality, RC tears are probably a multifactorial byproduct of the interaction of intrinsic and extrinsic causes.18 In 1934, Codman espoused the “intrinsic” theory that age-related tendon damage compounded by chronic microtrauma results in partial thickness tears, which usually then progress to full thickness tears.19 An “extrinsic” cause was first suggested in 1972, when Neer proposed that RC tears were secondary to subacromial impingement and, therefore, best treated with anterior acromioplasty.20 It was traditionally taught that hypovascularity within the critical zone located 10 to 15 mm proximal to the supraspinatus insertion was a key component of RC tears.21,22 More recent research conclusively demonstrated that no significant hypovascular zone exists.23-25 Moreover, Matthews and coworkers found that small RC tears showed increased fibroblast cellularity and blood vessel proliferation, which gave them greater potential to heal.26 Additional studies demonstrate that as tear size increases the healing response fails, cytokines upregulate, and vascularity decreases, eventually resulting in hypoxic damage and apoptosis.27-29 These novel findings imply the benefit of early rehabilitation and/or surgical management before tears progress. Numerous rotator-cuff-tear classification systems have been proposed.56-60 Though several are highly accurate, they are similarly complex and lack intraobserver and interobserver agreement. With an increasing emphasis on evidence-based medicine, MRI descriptions of RC tears need to be accurate, simple, and precise with high interobserver agreement.61 Common pathology of the RC tendons includes full thickness tears, partial thickness tears, and tendinosis. Partial thickness tears involve a spectrum of findings and are broadly classified into 3 different types according to the portion of the tendon that is abnormal: articular-sided tears, bursal-sided tears, and interstitial tears. Partial thickness, articular-sided RC tears involving the insertional fibers of the anterior-most aspect of the supraspinatus (Figure 5), sometimes referred to as rim-rents, are very common tears, but they are easily overlooked.72 Becoming more aware of these tears, their location and their frequency should lead to a focused evaluation for these defects. Specific techniques to look for rim-rents will be discussed in the search pattern section below. Interstitial tears may represent up to 33% of partial thickness tears77 and are thought to represent shearing forces within a degenerated tendon.78 Interstitial tears (Figure 6), also known as intrasubstance tears or intramuscular cysts, can occur in isolation within the tendon without articular- or bursal-sided extension, or they can also occur in combination with either articular- or bursal-sided partial thickness tears. Intramuscular cysts, towards the larger, more elliptical end of the interstitial tear spectrum, were seen in 0.3% of a large retrospective series of shoulder MR examinations, and are almost always (96-100%) associated with an RC tear.66,79,80 Though management of isolated interstitial tears remains controversial, they should be reported since they are not visible to the arthroscopist. Normal RC tendons, composed primarily of collagen bundles, are characterized by uniform hypointense signal intensity on all pulse sequences. Though in the past the term “tendonitis” had been used to refer to a variety of shoulder problems, degenerative and traumatic changes of the RC tendons do not always include inflammation, so tendinosis or tendinopathy are the preferred terms. Histological changes of RC tendons, most commonly mucoid degeneration and fibrocartilaginous metaplasia, appear as moderately increased focal irregular or diffuse intermediate intrasubstance signal intensity on T1- and T2-weighted images.64 This altered MRI signal intensity does not rise to the same T2 signal intensity as fluid and is usually more globular in appearance and less linear than signal abnormalities seen with RC tears. 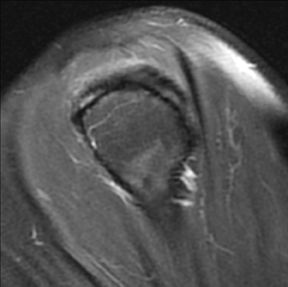 The tendon may be normal in caliber or demonstrate diffuse or focal thickening (Figure 7).81 Sein et al showed high intraobserver reliability, with an intraclass correlation of 0.85, in grading tendinosis as mild, moderate, or severe.82 In practice, it can occasionally be difficult to distinguish between severe tendinosis and a partial thickness tear; sometimes both possibilities must be considered. Humeral head “cysts,” foci of fluid signal intensity in the bone marrow of the greater tuberosity near the RC insertions, are common on shoulder MRI, seen in 70% of symptomatic patients and 24% of asymptomatic volunteers.51, 83 They occur most frequently within the posterior aspect of the greater tuberosity (56%-90%), followed by the anterior aspect of the greater tuberosity (20%-22%), and least often within the lesser tuberosity (15%).83, 84 Cysts within the posterior aspect of the greater tuberosity show no association to RC abnormalities, and are thought to represent normal variant pseudocysts, since they contain no synovial lining and are filled with thick connective tissue.83-85 While one article suggested no definite association between RC tears and cysts within the anterior aspect of the greater tuberosity,83 most studies endorse an association with RC disease. Sano et al in 1998 indicated that RC tears were always present when humeral head cysts were present in the superior facet or the anterior half of the middle facet.86 More recently, Fritz et al reported that cysts within the anterior aspect of the greater tuberosity (Figure 8) have a high positive predictive value (94%) for RC disease; further, anterior greater tuberosity cysts were rarely, only 2.5% of the time, seen with normal rotator cuffs.84 Cysts within the lesser tuberosity, though less common, almost always correlate with tears of the RC, particularly the overlying subscapularis or supraspinatus tendons.86,87 Humeral head “cysts” can simulate small insertional RC tears, and should therefore be evaluated on orthogonal views, which usually better reveal that the fluid-signal intensity is actually subcortical and not within the distal RC tendon. Muscular changes after RC tears are defined by 2 separate parameters: volume atrophy and fatty infiltration. 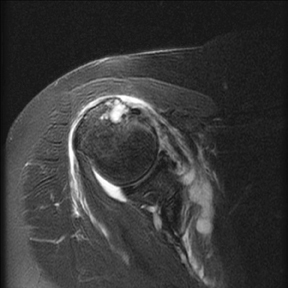 Since volume atrophy and fatty infiltration occur highly asymmetrically — especially in the supraspinatus due to the disproportionate biomechanical changes when anterior tendon fibers are torn — both qualifiers should always be evaluated and mentioned.88 Goutallier, using CT scans, proposed the first classification scheme for volume atrophy and fatty infiltration of RC muscles.89 Warner et al further expanded fatty atrophy evaluation using sagittal oblique T1-weighted MR images just medial to the coracoid. This volume atrophy classification scheme uses the tangent line, drawn horizontally between the superior edge of the coracoid and the scapular spine, and another line drawn vertically from the scapular spine to the inferior scapular tip. Muscle bellies that remain convex beyond these lines are graded as normal; those that are even with the lines are called mild atrophy; muscle concave below the line is moderately atrophied; muscle that is barely visible is severely atrophied (Figure 9).90 Fuchs et al modified Goutallier’s original classification scheme of fatty infiltration to MRI – describing the proportion of fatty streaks and replacement relative to muscle.91 Their original staging has been further qualified and descriptive modifiers are now usually used to describe fatty infiltration: no fatty deposits is described as no fatty infiltration; a few fatty streaks, as minimal fatty infiltration; some fatty infiltration, though still with more muscle than fat, as mild fatty infiltration; a roughly equal proportion of muscle and fatty infiltration as moderate fatty infiltration; and a predominance of fatty infiltration, as advanced fatty infiltration. Like most radiologic exams, shoulder MR imaging is best evaluated with a routine search pattern that pays specific attention to the usual locations of pathology and relies upon the specific strengths of each obtained sequence. Our standard shoulder MRI protocol contains 5 pulse sequences: sagittal oblique T1-weighted and fast spin echo (FSE) T2-weighted with fat saturation, axial FSE proton density and FSE T2-weighted with fat saturation, and coronal oblique FSE T2-weighted with fat saturation. The first component of MRI RC evaluation involves the muscle bellies on the T1-weighted and T2-weighted sagittal oblique sequences. As described previously, the presence of fatty infiltration or muscle volume atrophy is best evaluated on the T1-weighted sagittal oblique images. Sagittal oblique T2-weighted images are used to carefully evaluate the muscle bellies for often subtle or asymmetric edema. Muscular edema often represents an acute injury, such as muscle strain, particularly within the clinical context of an acute injury and when correlating findings of an acute RC tear are present. Neurogenic abnormalities can also cause muscle edema, if detected early, and muscle atrophy, if more chronic. They are usually identified by the distinct combination of muscle bellies involved: Suprascapular nerve entrapment at the suprascapular notch affects the supraspinatus and infraspinatus muscles; suprascapular nerve entrapment at the level of the spinoglenoid notch (distal to supraspinatus motor innervation) affects only the infraspinatus muscle; quadrilateral space syndrome (compression of the axillary nerve in the quadrilateral space) usually affects just the teres minor muscle; and Parsonage-Turner Syndrome, an acute brachial neuritis, can involve single or multiple nerve distributions (Figure 10). Beyond knowledge of RC anatomy, MRI relies upon landmarks to delineate the location of the RC tendons. The precise transition between the supraspinatus and infraspinatus is difficult to distinguish by MRI given their interdigitating fibers. When the patient is correctly positioned with the arm neutral or slightly externally rotated, the 12 o’clock humeral head position on sagittal oblique sequences is used to distinguish where the supraspinatus and infraspinatus insert on the greater tuberosity — supraspinatus fibers are anterior (10 and 11 o’clock), supraspinatus and infraspinatus fibers blend near 12 o’clock, and infraspinatus fibers posteriorly occupy the 1 and 2 o’clock positions. Internal rotation of the arm produces overlap of the supraspinatus and infraspinatus tendons, making evaluation of the RC difficult.92 With internal rotation or extreme external rotation, the humeral head clock positions are suboptimal for distinguishing the tendon insertions. Having evaluated the RC muscle bellies, and with a familiarity of how to distinguish the RC footprints, the search pattern next individually evaluates each of the 4 RC tendons. Most PACS display monitors allow similarly oriented sequences to be linked and orthogonal sequences to be cross-referenced. Beginning at the medial aspect of the sagittal oblique T2-weighted images, the supraspinatus muscle is first located by its anatomic position on the scapula. Proceeding laterally, sagittal oblique images are incrementally examined. When abnormalities are seen or suspected in the supraspinatus tendon on sagittal oblique images, they are cross-referenced on coronal oblique images. The integrity of the supraspinatus tendon is again completely evaluated by the coronal oblique sequence. The extra-articular long biceps tendon is located on the anterior coronal oblique images, and proceeding posteriorly, the anterior-most fibers of the supraspinatus tendon are evaluated. Again, any signal abnormality detected within the supraspinatus tendon on coronal oblique images is cross-referenced and evaluated on the sagittal oblique images. Abnormal supraspinatus findings — tendinosis or partial or full thickness tears — are categorized and described, as mentioned earlier. A similar 2-plane approach is used to confirm and evaluate the status of each remaining tendon, usually proceeding from the supraspinatus to the infraspinatus, then to the subscapularis, and finally, to the teres minor, which is almost never torn. Since partial thickness tears involving the far anterior supraspinatus fibers have a high prevalence, are often difficult to visualize (particularly when the arm is internally rotated), and as a result are frequently missed,72 the last step involves an intentional search for rim-rents. Because they are often difficult to locate on sagittal oblique images, we rely instead upon coronal oblique and axial sequences. The extra-articular long head of the biceps tendon is identified on coronal oblique images; the anterior-most fibers of the supraspinatus are located just posterior to that point. These anterior fibers are also cross-referenced on axial images as a precautionary final look. Our understanding of rotator cuff pathogenesis and the optimal management of RC pathology is evolving. 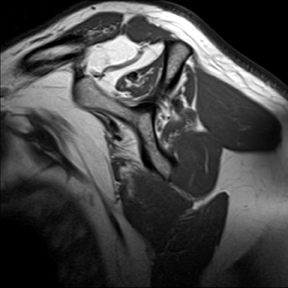 Shoulder MRI is a valuable tool in evaluating the patient with a painful shoulder, as it accurately depicts RC tendon pathology and any associated muscle abnormalities. In addition, shoulder MRI may reveal concurrent or alternative diagnoses, beyond the scope of this article, which can mimic RC disease clinically. Mochizuki T, Sugaya H, Uomizu M, et al. Humeral insertion of the supraspinatus and infraspinatus. New anatomical findings regarding the footprint of the rotator cuff. Surgical technique. J Bone Joint Surg Am. 2009;91 Suppl 2 Pt 1:1-7. Mochizuki T, Sugaya H, Uomizu M, et al. Humeral insertion of the supraspinatus and infraspinatus. New anatomical findings regarding the footprint of the rotator cuff. J Bone Joint Surg Am. 2008;90:962-969. DeFranco MJ, Cole BJ. Current perspectives on rotator cuff anatomy. Arthroscopy. 2009;25: 305-320. Andarawis-Puri N, Kuntz AF, Kim SY, Soslowsky LJ. Effect of anterior supraspinatus tendon partial-thickness tears on infraspinatus tendon strain through a range of joint rotation angles. J Shoulder Elbow Surg. 2010;19:617-623. Andarawis-Puri N, Ricchetti ET, Soslowsky LJ. Rotator cuff tendon strain correlates with tear propagation. J Biomech. 2009;42:158-163. Reilly P, Amis AA, Wallace AL, Emery RJ. Supraspinatus tears: Propagation and strain alteration. J Shoulder Elbow Surg. 2003;12:134-138. Ide J, Tokiyoshi A, Hirose J, Mizuta H. An anatomic study of the subscapularis insertion to the humerus: The subscapularis footprint. Arthroscopy. 2008;24:749-753. Morag Y, Jamadar DA, Miller B, et al. The subscapularis: Anatomy, injury, and imaging. Skeletal Radiol. 2011;40:255-269. Boon JM, de Beer MA, Botha D, et al. The anatomy of the subscapularis tendon insertion as applied to rotator cuff repair. J Shoulder Elbow Surg. 2004;13:165-169. Brox JI. Regional musculoskeletal conditions: Shoulder pain. Best Pract Res Clin Rheumatol. 2003;17:33-56. Taylor W. Musculoskeletal pain in the adult New Zealand population: Prevalence and impact. N Z Med J. 2005;118:U1629. Reilly P, Macleod I, Macfarlane R, et al. Dead men and radiologists don’t lie: A review of cadaveric and radiological studies of rotator cuff tear prevalence. Ann R Coll Surg Engl. 2006;88:116-121. Yamamoto A, Takagishi K, Osawa T, et al. Prevalence and risk factors of a rotator cuff tear in the general population. J Shoulder Elbow Surg. 2010;19:116-120. Yamaguchi K, Ditsios K, Middleton WD, et al. The demographic and morphological features of rotator cuff disease. A comparison of asymptomatic and symptomatic shoulders. J Bone Joint Surg Am. 2006;88:1699-1704. Fehringer EV, Sun J, Van Oeveren LS, et al. Full-thickness rotator cuff tear prevalence and correlation with function and co-morbidities in patients sixty-five years and older. J Shoulder Elbow Surg. 2008;17:881-885. Milgrom C, Schaffler M, Gilbert S, van Holsbeeck M. Rotator-cuff changes in asymptomatic adults. The effect of age, hand dominance and gender. J Bone Joint Surg Br. 1995;77:296-298. Keener JD, Steger-May K, Stobbs G, Yamaguchi K. Asymptomatic rotator cuff tears: Patient demographics and baseline shoulder function. J Shoulder Elbow Surg. 2010;19:1191-1198. Abate M, Silbernagel KG, Siljeholm C, et al. Pathogenesis of tendinopathies: Inflammation or degeneration? Arthritis Res Ther. 2009;11:235. Codman EA. The shoulder: Rupture of the supraspinatus tendon and other lesions in or about the subacromial bursa. Boston, MA: Thomas Todd Company; 1934. Neer CS, 2nd. Anterior acromioplasty for the chronic impingement syndrome in the shoulder: A preliminary report. J Bone Joint Surg Am. 1972;54:41-50. Codman EA, Akerson IB. The pathology associated with rupture of the supraspinatus tendon. Ann Surg. 1931;93:348-359. Lohr JF, Uhthoff HK. The microvascular pattern of the supraspinatus tendon. Clin Orthop Relat Res. 1990:35-38. Moseley HF, Goldie I. The arterial pattern of the rotator cuff of the shoulder. J Bone Joint Surg Br. 1963;45:780-789. Brooks CH, Revell WJ, Heatley FW. A quantitative histological study of the vascularity of the rotator cuff tendon. J Bone Joint Surg Br. 1992;74:151-153. Lewis JS, Raza SA, Pilcher J, et al. The prevalence of neovascularity in patients clinically diagnosed with rotator cuff tendinopathy. BMC Musculoskelet Disord. 2009;10:163. Matthews TJ, Hand GC, Rees JL, et al. Pathology of the torn rotator cuff tendon. Reduction in potential for repair as tear size increases. J Bone Joint Surg Br. 2006;88:489-495. Hegedus EJ, Cook C, Brennan M, et al. Vascularity and tendon pathology in the rotator cuff: A review of literature and implications for rehabilitation and surgery. Br J Sports Med. 2010;44:838-847. Millar NL, Wei AQ, Molloy TJ, et al. Cytokines and apoptosis in supraspinatus tendinopathy. J Bone Joint Surg Br. 2009;91:417-424. Benson RT, McDonnell SM, Knowles HJ, et al. Tendinopathy and tears of the rotator cuff are associated with hypoxia and apoptosis. J Bone Joint Surg Br. 2010;92:448-453. Fukuda H. Partial-thickness rotator cuff tears: A modern view on Codman’s classic. J Shoulder Elbow Surg. 2000;9:163-168. Brownlow HC, Smith C, Corner T, et al. Pain and stiffness in partial-thickness rotator cuff tears. Am J Orthop. 2009;38:338-340. Hegedus EJ, Goode A, Campbell S, et al. Physical examination tests of the shoulder: A systematic review with meta-analysis of individual tests. Br J Sports Med. 2008;42:80-92; discussion 92. Beaudreuil J, Nizard R, Thomas T, et al. Contribution of clinical tests to the diagnosis of rotator cuff disease: A systematic literature review. Joint Bone Spine. 2009;76:15-19. Williams GR, Jr., Rockwood CA, Jr., Bigliani LU, et al. Rotator cuff tears: Why do we repair them? J Bone Joint Surg Am. 2004;86-A:2764-2776. Galatz LM, Griggs S, Cameron BD, Iannotti JP. Prospective longitudinal analysis of postoperative shoulder function: A ten-year follow-up study of full-thickness rotator cuff tears. J Bone Joint Surg Am. 2001;83-A:1052-1056. Ellman H, Kay SP, Wirth M. Arthroscopic treatment of full-thickness rotator cuff tears: 2- to 7-year follow-up study. Arthroscopy. 1993;9:195-200. Fukuda H. The management of partial-thickness tears of the rotator cuff. J Bone Joint Surg Br. 2003;85:3-11. Goutallier D, Postel JM, Lavau L, Bernageau J. Impact of fatty degeneration of the suparspinatus and infraspinatus msucles on the prognosis of surgical repair of the rotator cuff [in French] Rev Chir Orthop Reparatrice Appar Mot. 1999;85:668-676. 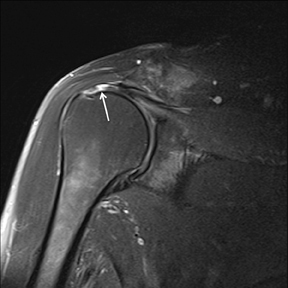 Melis B, Nemoz C, Walch G. Muscle fatty infiltration in rotator cuff tears: Descriptive analysis of 1688 cases. Orthop Traumatol Surg Res. 2009;95:319-324. Shen PH, Lien SB, Shen HC, et al. Long-term functional outcomes after repair of rotator cuff tears correlated with atrophy of the supraspinatus muscles on magnetic resonance images. J Shoulder Elbow Surg. 2008;17:1S-7S. Gladstone JN, Bishop JY, Lo IK, Flatow EL. Fatty infiltration and atrophy of the rotator cuff do not improve after rotator cuff repair and correlate with poor functional outcome. Am J Sports Med. 2007;35:719-728. Kim HM, Dahiya N, Teefey SA, et al. Relationship of tear size and location to fatty degeneration of the rotator cuff. J Bone Joint Surg Am. 2010;92:829-839. Melis B, DeFranco MJ, Chuinard C, Walch G. Natural history of fatty infiltration and atrophy of the supraspinatus muscle in rotator cuff tears. Clin Orthop Relat Res. 2010;468:1498-1505. Melis B, Wall B, Walch G. Natural history of infraspinatus fatty infiltration in rotator cuff tears. J Shoulder Elbow Surg. 2010;19:757-763. Bloom RA. The active abduction view: A new maneuvre in the diagnosis of rotator cuff tears. Skeletal Radiol. 1991;20:255-258. Moosikasuwan JB, Miller TT, Burke BJ. Rotator cuff tears: Clinical, radiographic, and US findings. Radiographics. 2005;25:1591-1607. Goud A, Segal D, Hedayati P, et al. Radiographic evaluation of the shoulder. Eur J Radiol. 2008;68:2-15. Bryant L, Shnier R, Bryant C, Murrell GA. A comparison of clinical estimation, ultrasonography, magnetic resonance imaging, and arthroscopy in determining the size of rotator cuff tears. J Shoulder Elbow Surg. 2002;11:219-224. Rutten MJ, Jager GJ, Kiemeney LA. Ultrasound detection of rotator cuff tears: Observer agreement related to increasing experience. AJR Am J Roentgenol. 2010;195:W440-446. de Jesus JO, Parker L, Frangos AJ, Nazarian LN. Accuracy of MRI, MR arthrography, and ultrasound in the diagnosis of rotator cuff tears: a meta-analysis. AJR Am J Roentgenol. 2009;192:1701-1707. Magee T, Shapiro M, Williams D. Comparison of high-field-strength versus low-field-strength MRI of the shoulder. AJR Am J Roentgenol. 2003;181:1211-1215. 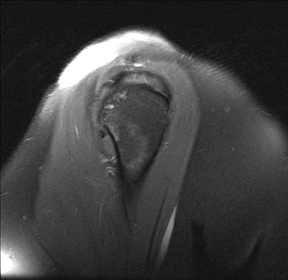 Magee T, Williams D. 3.0-T MRI of the supraspinatus tendon. AJR Am J Roentgenol. 2006;187: 881-886. Arekapudi SR, Jamadar DA, Caoili EM, et al. MRI interpretation proficiency of musculoskeletal fellows in training. Acad Radiol. 2009;16:380-385. Theodoropoulos JS, Andreisek G, Harvey EJ, Wolin P. Magnetic resonance imaging and magnetic resonance arthrography of the shoulder: Dependence on the level of training of the performing radiologist for diagnostic accuracy. Skeletal Radiol. 2010;39:661-667. Kuhn JE, Dunn WR, Ma B, et al. Interobserver agreement in the classification of rotator cuff tears. Am J Sports Med. 2007;35:437-441. DeOrio JK, Cofield RH. Results of a second attempt at surgical repair of a failed initial rotator-cuff repair. J Bone Joint Surg Am. 1984;66:563-567. Ellman H. Diagnosis and treatment of incomplete rotator cuff tears. Clin Orthop Relat Res. 1990:64-74. Harryman DT, Mack LA, Wang KY, et al. Repairs of the rotator cuff. Correlation of functional results with integrity of the cuff. J Bone Joint Surg Am. 1991;73:982-989. Patte D. Classification of rotator cuff lesions. Clin Orthop Relat Res. 1990:81-86. Wolfgang GL. Surgical repair of tears of the rotator cuff of the shoulder. Factors influencing the result. J Bone Joint Surg Am. 1974;56:14-26. Spencer EE, Jr., Dunn WR, Wright RW, et al. Interobserver agreement in the classification of rotator cuff tears using magnetic resonance imaging. Am J Sports Med. 2008;36:99-103. Longo UG, Franceschi F, Ruzzini L, et al. Light microscopic histology of supraspinatus tendon ruptures. Knee Surg Sports Traumatol Arthrosc. 2007;15:1390-1394. Farley TE, Neumann CH, Steinbach LS, et al. 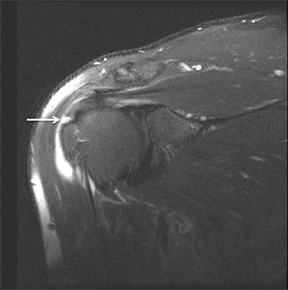 Full-thickness tears of the rotator cuff of the shoulder: Diagnosis with MR imaging. AJR Am J Roentgenol. 1992;158:347-351. Buck FM, Grehn H, Hilbe M, et al. Magnetic resonance histologic correlation in rotator cuff tendons. J Magn Reson Imaging. 2010;32:165-172. Cvitanic O, Schimandle J, Cruse A, Minter J. The acromioclavicular joint cyst: Glenohumeral joint communication revealed by MR arthrography. J Comput Assist Tomogr. 1999;23:141-143. Sanders TG, Tirman PF, Feller JF, Genant HK. Association of intramuscular cysts of the rotator cuff with tears of the rotator cuff: Magnetic resonance imaging findings and clinical significance. Arthroscopy. 2000;16:230-235. Saupe N, Pfirrmann CW, Schmid MR, et al. Association between rotator cuff abnormalities and reduced acromiohumeral distance. AJR Am J Roentgenol. 2006;187:376-382. Holt RG, Helms CA, Steinbach L, et al. Magnetic resonance imaging of the shoulder: Rationale and current applications. Skeletal Radiol. 1990;19:5-14. Needell SD, Zlatkin MB, Sher JS, et al. 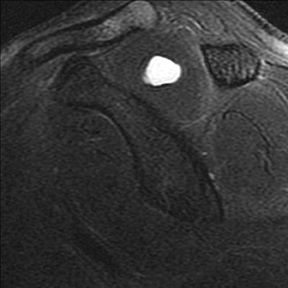 MR imaging of the rotator cuff: Peritendinous and bone abnormalities in an asymptomatic population. AJR Am J Roentgenol. 1996;166:863-867. Schweitzer ME, Magbalon MJ, Frieman BG, et al. 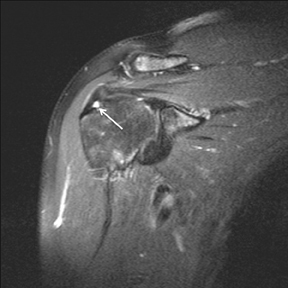 Acromioclavicular joint fluid: Determination of clinical significance with MR imaging. Radiology. 1994;192:205-207. Liou JT, Wilson AJ, Totty WG, Brown JJ. 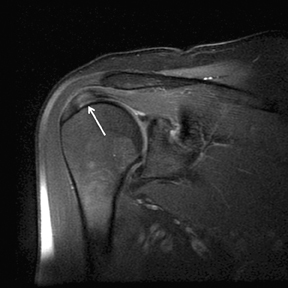 The normal shoulder: Common variations that simulate pathologic conditions at MR imaging. Radiology. 1993;186:435-441. Vinson EN, Helms CA, Higgins LD. Rim-rent tear of the rotator cuff: A common and easily overlooked partial tear. AJR Am J Roentgenol. 2007;189:943-946. Kjellin I, Ho CP, Cervilla V, et al. Alterations in the supraspinatus tendon at MR imaging: Correlation with histopathologic findings in cadavers. Radiology. 1991;181:837-841. Ruotolo C, Fow JE, Nottage WM. The supraspinatus footprint: An anatomic study of the supraspinatus insertion. Arthroscopy. 2004;20:246-249. Wolff AB, Sethi P, Sutton KM, et al. Partial-thickness rotator cuff tears. J Am Acad Orthop Surg. 2006;14:715-725. Finnan RP, Crosby LA. Partial-thickness rotator cuff tears. J Shoulder Elbow Surg. 2010;19:609-616. Schaeffeler C, Mueller D, Kirchhoff C, et al. 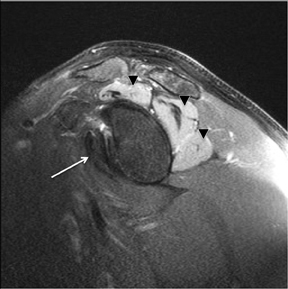 Tears at the rotator cuff footprint: Prevalence and imaging characteristics in 305 MR arthrograms of the shoulder. Eur Radiol. 2011;21(7):1477-1484. Fukuda H, Hamada K, Nakajima T, Tomonaga A. Pathology and pathogenesis of the intratendinous tearing of the rotator cuff viewed from en bloc histologic sections. Clin Orthop Relat Res. 1994:60-67. Kassarjian A, Torriani M, Ouellette H, Palmer WE. 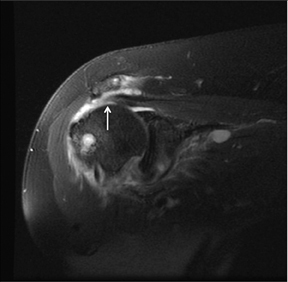 Intramuscular rotator cuff cysts: Association with tendon tears on MRI and arthroscopy. AJR Am J Roentgenol. 2005;185:160-165. Manvar AM, Kamireddi A, Bhalani SM, Major NM. Clinical significance of intramuscular cysts in the rotator cuff and their relationship to full- and partial-thickness rotator cuff tears. AJR Am J Roentgenol. 2009;192:719-724. Kassarjian A, Bencardino JT, Palmer WE. MR imaging of the rotator cuff. Magn Reson Imaging Clin N Am. 2004;12:39-60, vi. Sein ML, Walton J, Linklater J, et al. Reliability of MRI assessment of supraspinatus tendinopathy. Br J Sports Med. 2007;41:e9. Williams M, Lambert RG, Jhangri GS, et al. 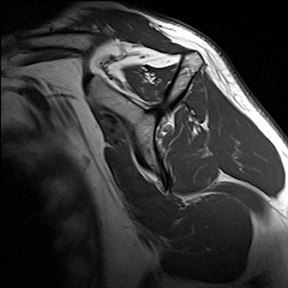 Humeral head cysts and rotator cuff tears: An MR arthrographic study. Skeletal Radiol. 2006;35: 909-914. Fritz LB, Ouellette HA, O’Hanley TA, et al. Cystic changes at supraspinatus and infraspinatus tendon insertion sites: association with age and rotator cuff disorders in 238 patients. Radiology. 2007;244:239-248. Jin W, Ryu KN, Park YK, et al. Cystic lesions in the posterosuperior portion of the humeral head on MR arthrography: correlations with gross and histologic findings in cadavers. AJR Am J Roentgenol. 2005;184:1211-1215. Sano A, Itoi E, Konno N, et al. 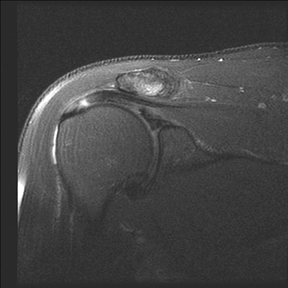 Cystic changes of the humeral head on MR imaging. Relation to age and cuff-tears. Acta Orthop Scand. 1998;69:397-400. Wissman RD, Kapur S, Akers J, et al. 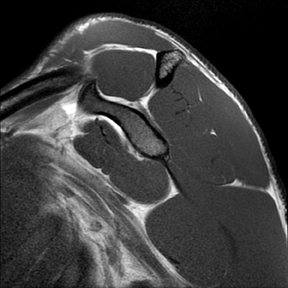 Cysts within and adjacent to the lesser tuberosity and their association with rotator cuff abnormalities. AJR Am J Roentgenol. 2009;193:1603-1606. Meyer DC, Pirkl C, Pfirrmann CW, et al. 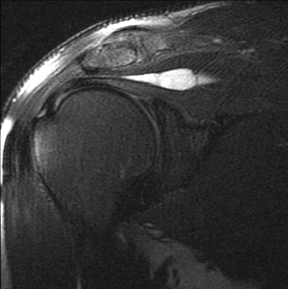 Asymmetric atrophy of the supraspinatus muscle following tendon tear. J Orthop Res. 2005;23:254-258. Goutallier D, Postel JM, Bernageau J, et al. Fatty muscle degeneration in cuff ruptures. Pre- and postoperative evaluation by CT scan. Clin Orthop Relat Res. 1994:78-83. Warner JJ, Higgins L, Parsons IM, Dowdy P. Diagnosis and treatment of anterosuperior rotator cuff tears. J Shoulder Elbow Surg. 2001;10:37-46. Fuchs B, Weishaupt D, Zanetti M, et al. 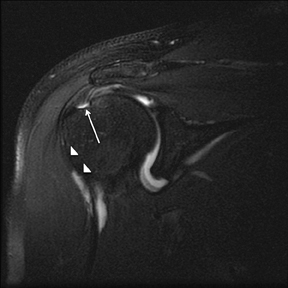 Fatty degeneration of the muscles of the rotator cuff: Assessment by computed tomography versus magnetic resonance imaging. J Shoulder Elbow Surg. 1999;8:599-605. Davis SJ, Teresi LM, Bradley WG, et al. Effect of arm rotation on MR imaging of the rotator cuff. Radiology. 1991;181:265-268. 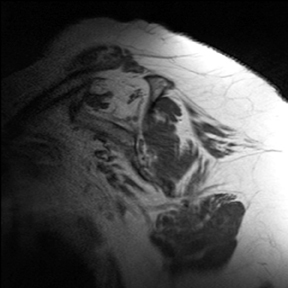 MRI of the shoulder: Rotator cuff. Appl Radiol.